Style template number eighteen has a large colorful header which contains your name and other contact information, below that there is an underline of the same color. All the text is set to the left, the section headers are capitalized. The main feature of this template is your information is at the top of the page on a large colorful backdrop. The important facts about what you learned in school and your major accomplishments at work are placed in list format with round bullets. Once you have your resume sorted out your next move is to begin writing your cover letter. Not all businesses may require a cover letter, but you still need to write one so you are prepared if you do need it. While you're at it put a reference page together too. Luckily we have online tools to generate all these documents so it won't be that big a problem to do it. When you create a resume you can use the program to export your information directly into our other programs to make documents that all use the same stationery. Another time-saver would be to create your resume here before you apply for a job online using the company's application form. This way you can consult the resume from us to answer the questions asked by the company's application form. Likewise when you need to add in personal and professional references. With a reference page generated here you will already have all your reference information on hand and ready to go. 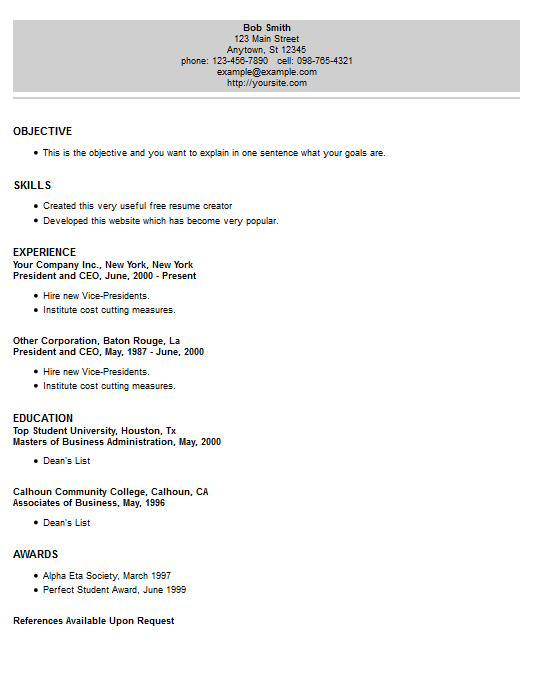 To get this template export it from our resume creator program.